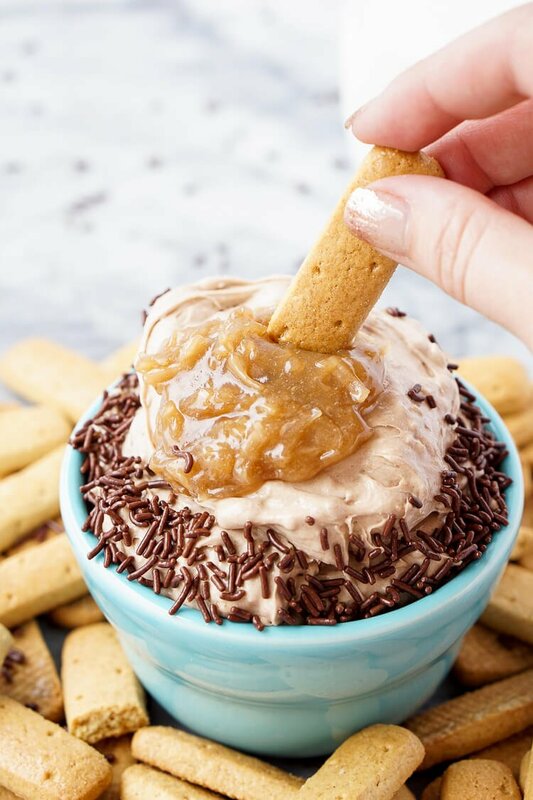 This German Chocolate Cake Batter Dip is made in less than 5 minutes with just 3 ingredients and is super addictive! You just can’t beat that delicious mix of chocolate, coconut, pecans and caramel! Happy Monday, friends! I know it’s been a bit quiet around here, but it’s summer and most of you have probably been enjoying the beautiful weather instead of glued to your screens. Or maybe you’ve been like me and still been glued to your screens thanks to Pokémon Go. Anyone else super excited to dive back into their childhood with this fun and interactive game? 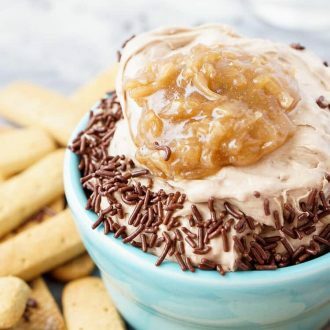 At least it’s like an exercise app in disguise so I can eat some of this amazing German Chocolate Cake Batter Dip and then walk it off while I catch me some Eevee’s! Did you know there’s actually nothing German about German Chocolate Cake? It originated here in the United States. 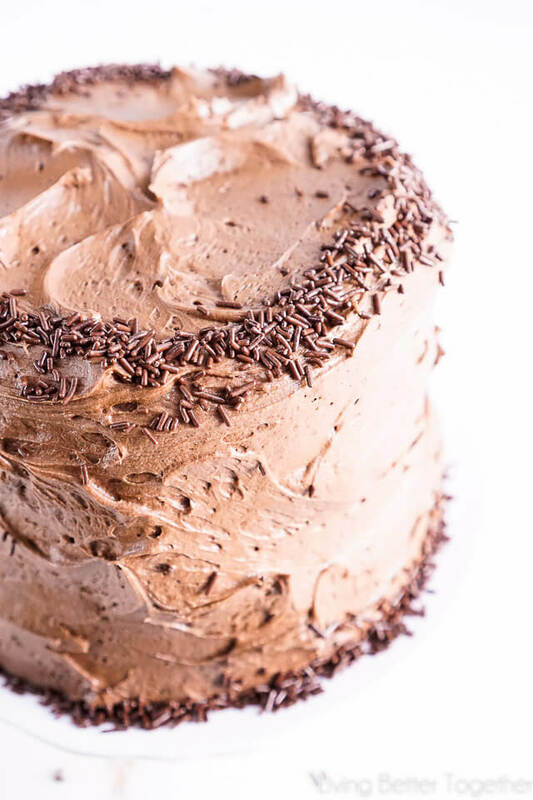 In 1852, a man named Samuel German developed the baking chocolate used in the famous cake for the Baker’s Chocolate Company. You know, the Baker’s bars we all use, especially around the holidays, well there used to be on called Baker’s German’s Sweet Chocolate. It was these bars that were used by Mrs. George Clay to make the very first German Chocolate Cake, whose recipe was published in the Dallas Morning Star back in 1957, and that’s a brief history of the decadent dessert we all know and love! But today, we’re not making German Chocolate Cake, at least not in the fluffy form. 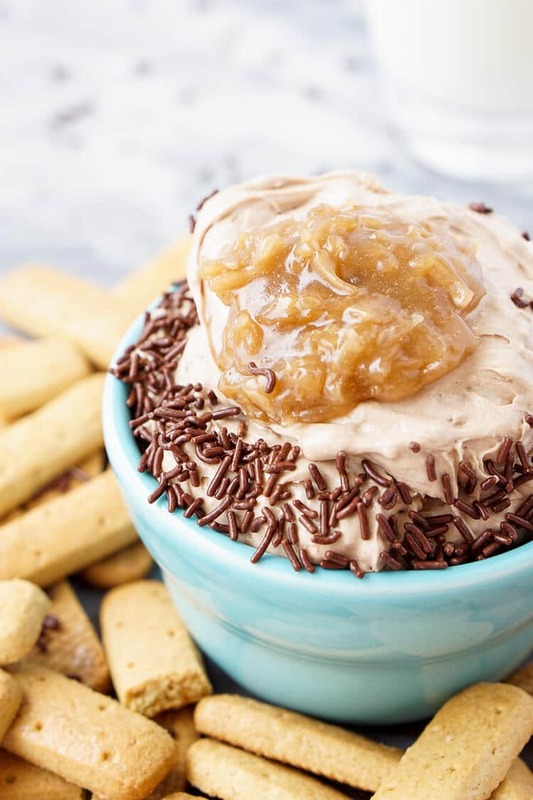 We’re going to take that delicious cake mix, combine it with some cool whip and the German chocolate frosting we all know and love for a dessert that’s ready in just a few minutes! You’re going to become quite addicted, both to how easy this dip is to make and how amazing it tastes! 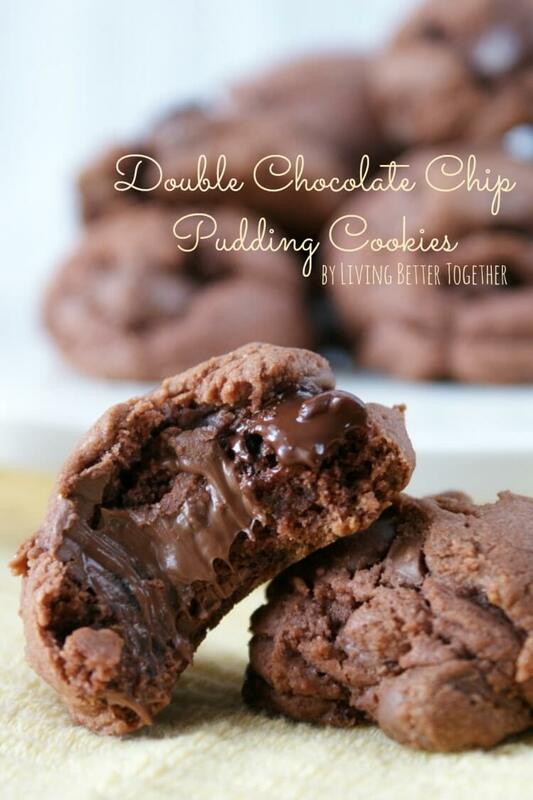 You can add in chocolate sprinkles for extra fun and dip pretty much anything you want in it! Serve it up at a party and it won’t last long! 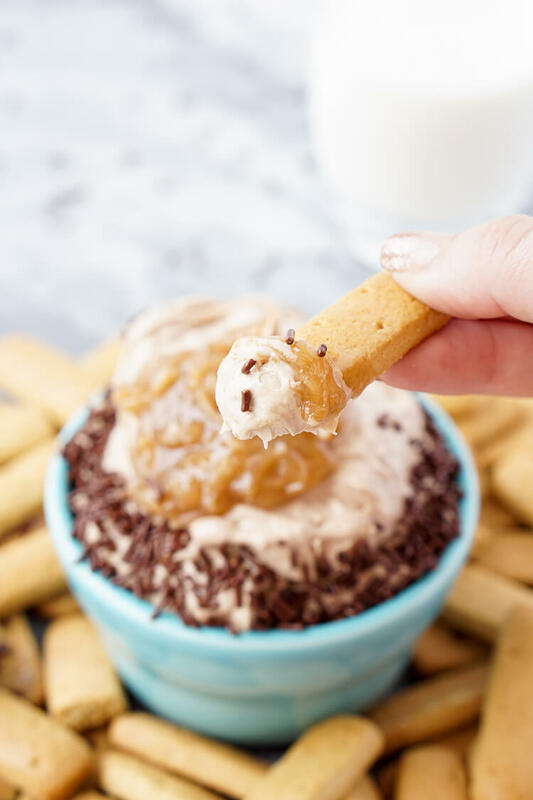 This German Chocolate Cake Batter Dip is made in less than 5 minutes with just 3 ingredients and is super addictive! 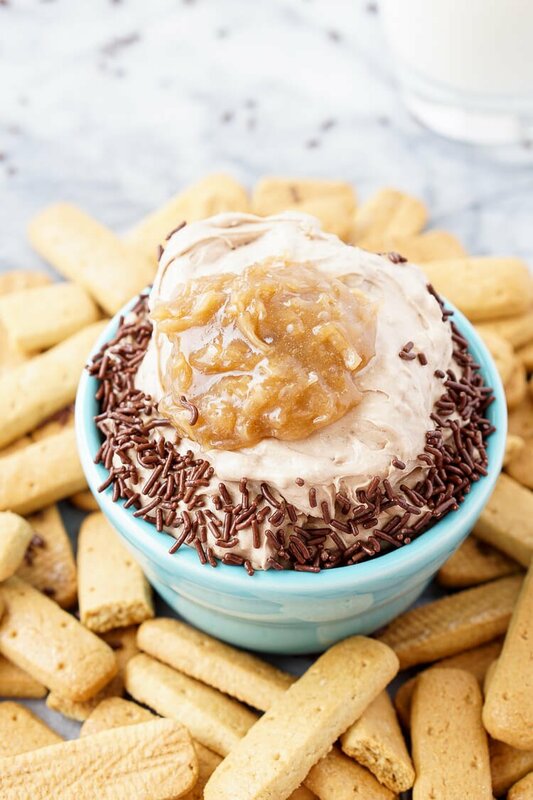 You just can't beat that delicious mix of chocolate, coconut, pecans and caramel! In a medium bowl with a hand mixer or a stand mixer fitted with a paddle attachment, beat the cool whip, cake mix, and 1 cup of frosting until fully combined. 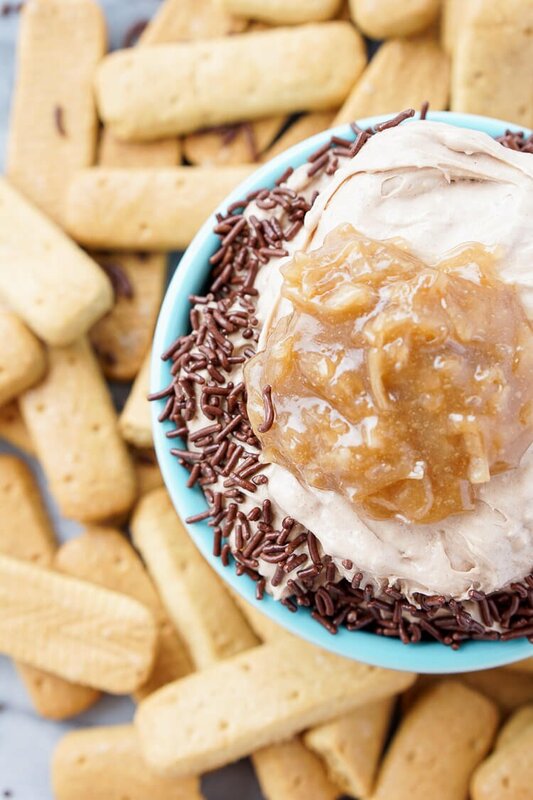 Transfer dip into a serving bowl and top with 2 tbsp of German chocolate frosting. Serve with graham crackers sticks, strawberries, or anything else you enjoy! You can fold chocolate sprinkles in if you'd like, just use them for garnish, or leave them out. Looks so good! Even better, it looks really easy!